I had great craic yesterday with Karen of Shamu Makes. 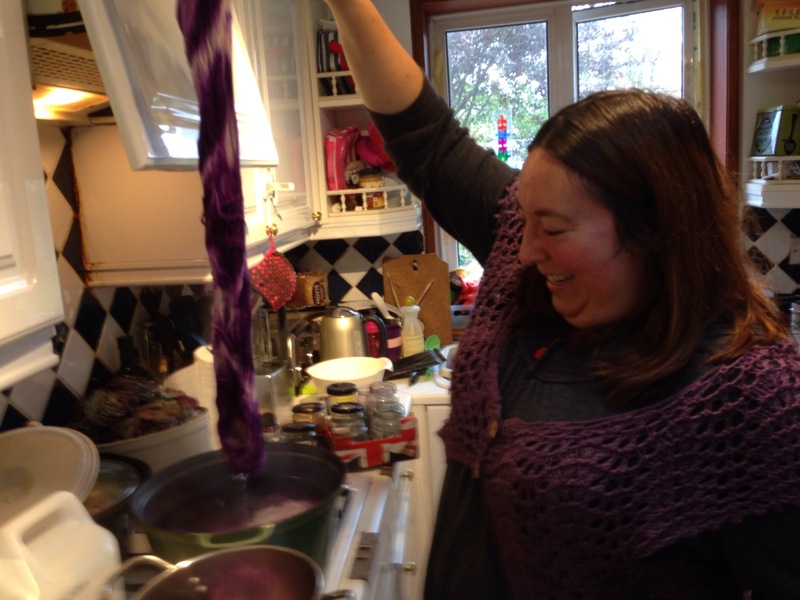 She was dying up lots of yarn, some for a very special charity, more of which later. Karen’s yarns are all one-off art yarns. She will kettle dye about 4 skeins at a time, each a different base. In one pot yesterday, she had a regular sock, a sparkle sock, an alpaca aran, and a tweedy dk. Karen dyes according to “what the pot tells me” which she hopes doesn’t make her sound barmy, but it’s a very fluid, unscripted process. 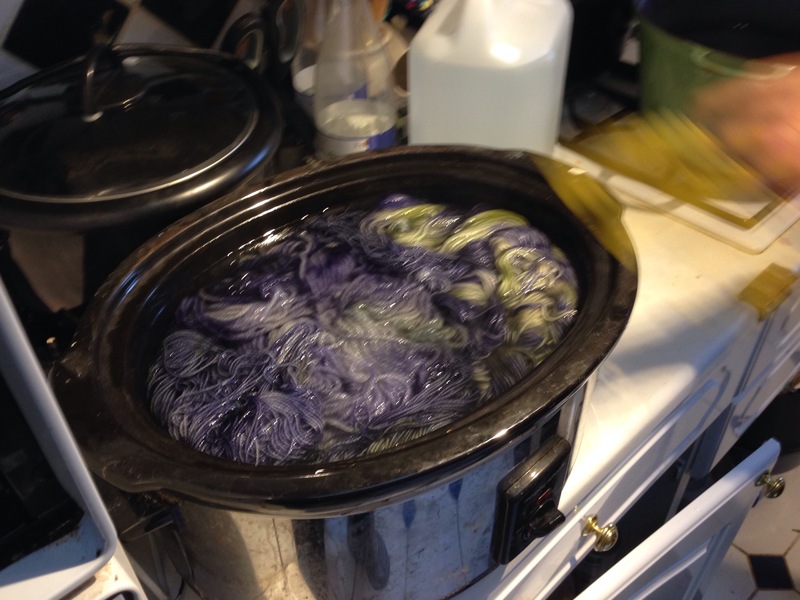 She can’t repeat colour ways, because what goes into the pot and how she treats the yarn can vary in so many ways; depending on her mood, the light, how the yarn picks up the dye, whether the yarn goes into the pot first or last, how long it’s in there, whether Karen feels like it needs more colour and how that gets overlayed – dying again or syringed or speckled. 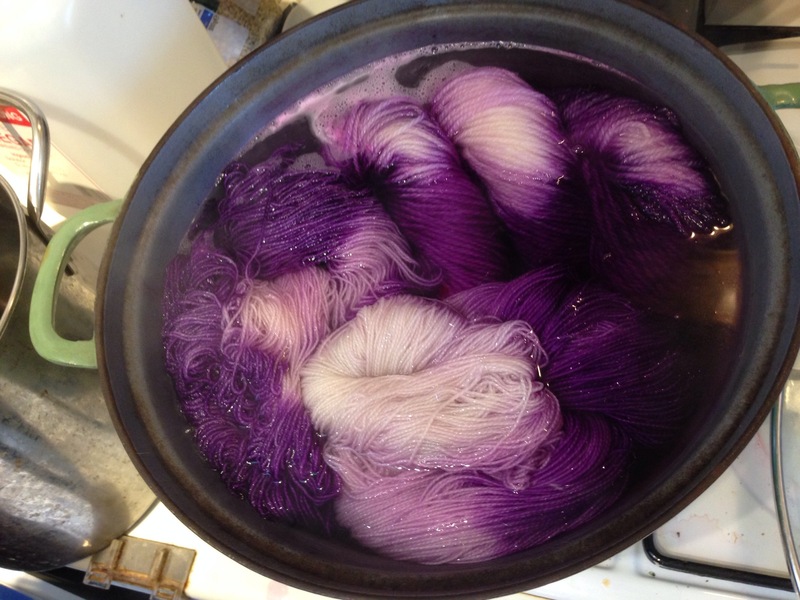 Yarns that come out of the same pot are called “sisters”; and they can be very similar, but no two are ever identical and colour ways cannot be repeated. 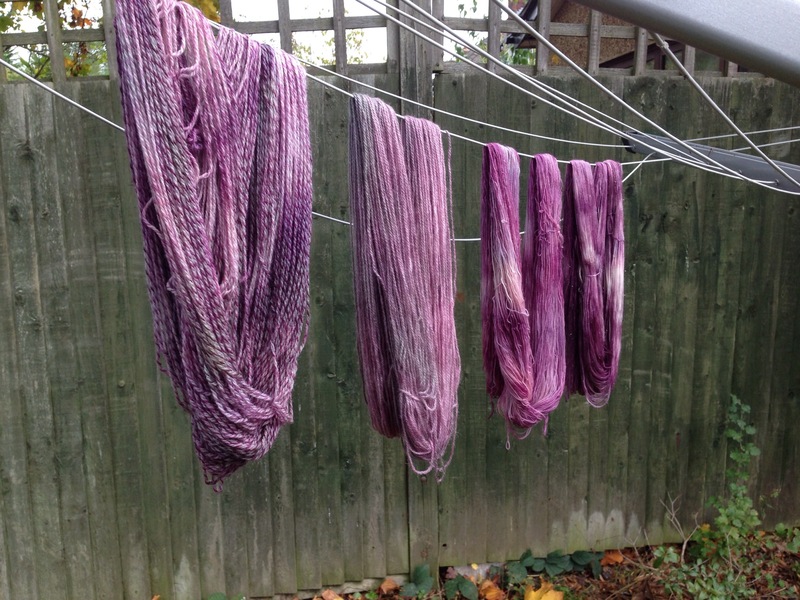 Karen may dye several skeins of the same base together to order, but along the lines of “something in pink and green”, not “25% cerise and 59% pistachio with a marled effect”. Check out the gorgeous two-tone effect in the foremost skein! These four are all sisters. Karen was dying in pink and purple for a very special cause. Another member of one of Karen’s online crafting communities has tragically lost her baby after 23 weeks of pregnancy. Karen is organising a fundraiser for SANDS, the stillbirth and neonatal death charity, by holding a raffle with her yarn and some other lovely bits as the prize. More details at http://www.justgiving.com/shamumakes. After a chat where karen and I decided we were both going to the Edinburgh yarn fest in March (Karen as a stall holder and me as a helper/designer/co-conspirator), we hung out some more yarn. Isn’t the pinky-purple-turquoisey-orangey one gorgeous? Believe me, those are colours I would never put together myself in a month of Sundays, but Karen seems to have the eye! I left with one forlorn look towards the slow-cooker, where a navy and spring green confection was still bubbling away. If you like the sound of Shamu Makes yarns, then you can get in touch with Karen through her facebook page or etsy shop. 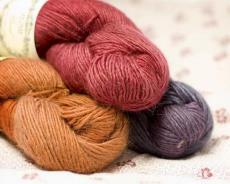 My grapevine tells me that Blacker Yarns have a new yarn coming out next month, November 14th. It’s a DK weight yarn, coming in 4 colours: natural grey, heathery-purple, denimy-blue and sagey-green. It’s a small palette, but I think all the colours are going to work well together. Definitely that green and purple would look great together, and I can easily imagine a fab cabled man’s jumper in the blue. I haven’t had any in my hands (yet), so I looked up the sheep breed information to get an idea of how it will feel. Staple length will tell you how long the fibres are in the yarn, and how much twist the yarn needs to hold together (longer fibres mean less twist). Fibre length also contributes to the strength of the knitted garment. Larger diameter fibres are also stronger, though they don’t tend to feel as soft. The larger diameter fibres are also harder wearing, but fewer people can wear them next to the skin. So my best guess is that Westcountry Tweed will make great hats and cowls, and winter jumpers. It’ll look and feel good for many years, and while I might not use it for baby gifts, I reckon it’s going to be perfect for keeping warm when it matters, for a gift that will keep on giving. I’m actually thinking house-warming and wedding blankets. I will let you know when I get a chance to try it! What is really interesting about the yarn though is that both sheep are rare breeds, from farms that are less than 100 miles from the mill, and Blacker yarns are continuing to do what they do best, bringing us great British yarns that celebrate the qualities of native and lesser-known breeds. Yarn labels can be daunting for the novice knitter. Luckily, they have become fairly well standardised, so once you can decipher one, you can read most of ’em. Showing 1. fibre content, 2. weight, 3. manufacturing details, 4. care information, 5. gauge information, 6. yardage, 7. needle info and anything else the yarn company want to tell you. The gauge is probably the most important piece of information. A DK weight yarn like this one will typically knit up so that a 10cm wide piece of knitting will be 22 sts, and a 10cm long piece of knitting will be 30sts. Or, as usually written, 22 sts x 30 rows = 10cm over stocking stitch. That grid symbol is used a lot, so look out for it on other ball bands. This pic shows colour/shade number and dyelot number. Some manufacturers put critical info like tension right at the end of the label, inside the ball, I’ve no idea why! Check it’s okay with the sales assistant first before you take the ball apart – they might have all the info you need in a folder or on a colour card (a card with a small sample of the yarn on it in each of the available colours). Don’t be afraid to check all your balls are from the same dyelot. Got a weird ball band you can’t decipher? Send over a pic and I’ll try decipher it for you! I’m working on a new project with Jane of StitchUpp. You are looking at the makings of two hats, a cowl and a capelet! Very excited to be working with Jane for the first time, especially since she’s opening her own premises in Uppingham soon, so keep an eye out! 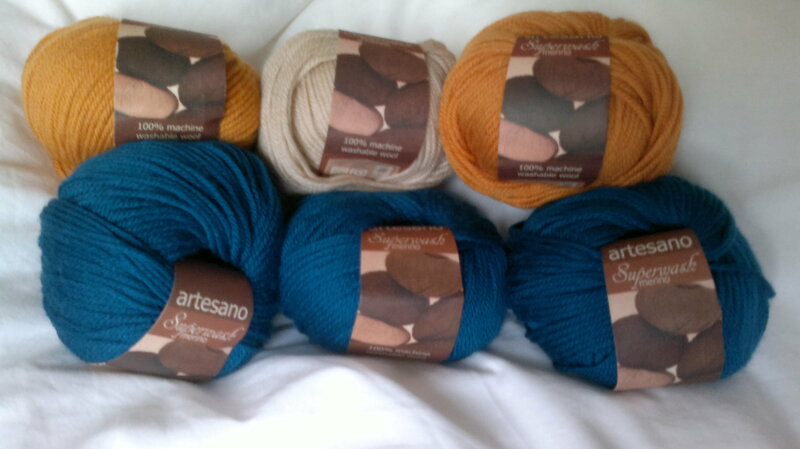 I haven’t tried Artesano Superwash Merino before, so when I’ve done some swatches, I’ll post a review here. Well, that was never going to work, was it? Me? Got to a joyful LYS and come away empty-handed? Excited to have an excuse to go fondle some yarn! 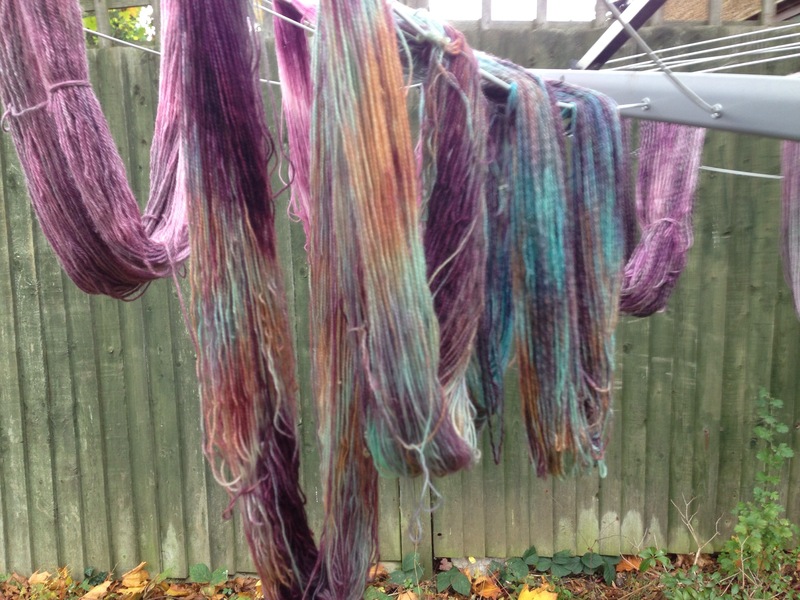 I need to source some DK-weight silk (or bamboo) blend yarn in high-contrast colours from an indie yarnie or spinner based in the UK or Ireland. This is for a design that needs to be finished by July 1st, so LET ME KNOW if you have such a beast! I’m going to take the two little skeinlings with me, oh joy! Does the buggy come too or no? Eternal question for mums on the tube! Tired babies versus hoiking the wheels… no, it comes, otherwise i’ll be carrying the pair of lumps up all those stairs at Angel! I really, really hope loop have swatched with these, cos otherwise I may be spending <gulp> £38 squids! 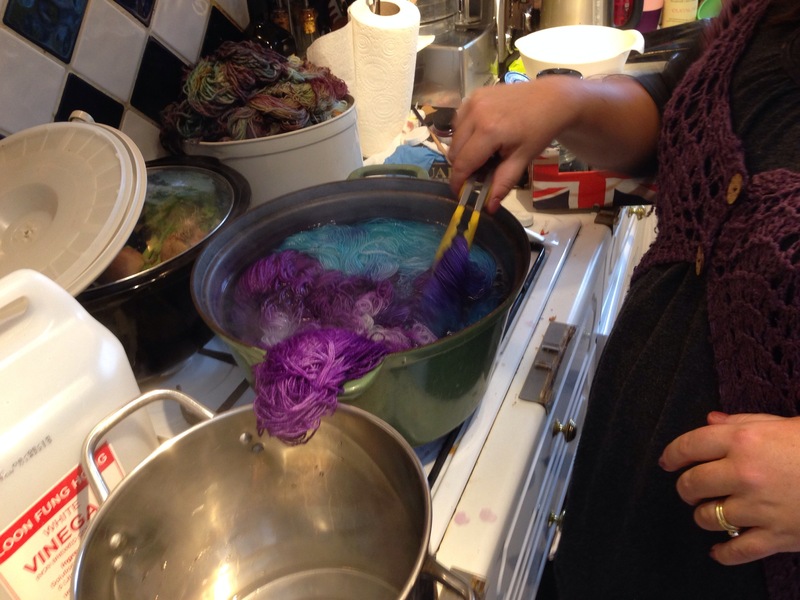 Indie Dyers & Spinners « Irish Knitting & Crochet.